One of the joys of working at the market is that I get to see – and sample – other people’s produce! Last week I had some great Katy apples from the fruit and veg stand, and this week I went there again for vegetables to stir fry in a sauce bought from my nextdoor trader, Kate. 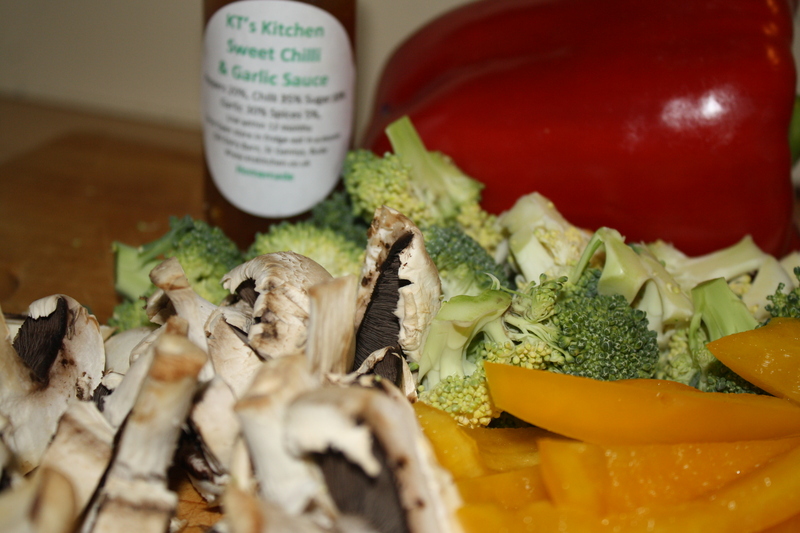 Kate sells a range of cooking sauces, spice mixes, oils and other treats and I couldn’t resist giving one a try. 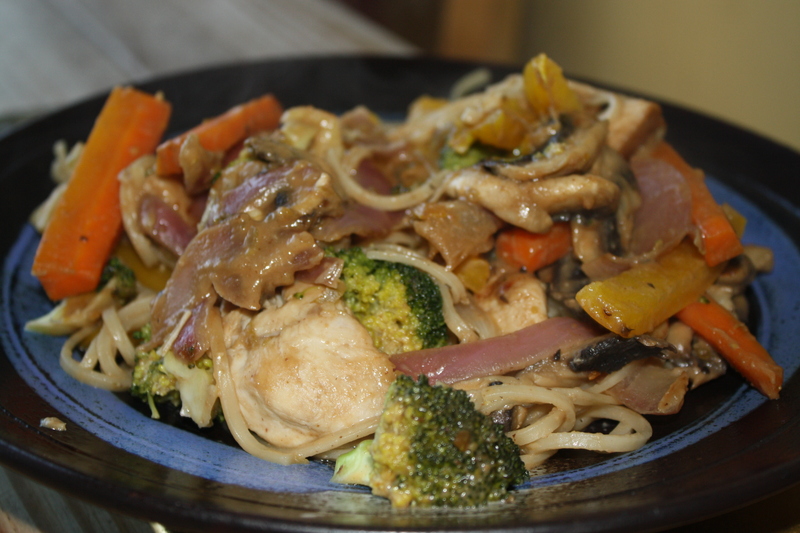 We had the Sweet Chilli and Garlic sauce and it was soo good 🙂 I stir fried chicken and noodles along with the market vegetables (1/2 a large red onion, 1 large yellow pepper, 1 broccoli, 1 carrot, a handful of mushrooms) in a generous helping of the sauce. I also added a spoonful of Fair Trade Peanut Butter and a squeeze of lime to give it a Pad Thai style flavour, but we could have had the sauce on it’s own too, as it was really tasty. 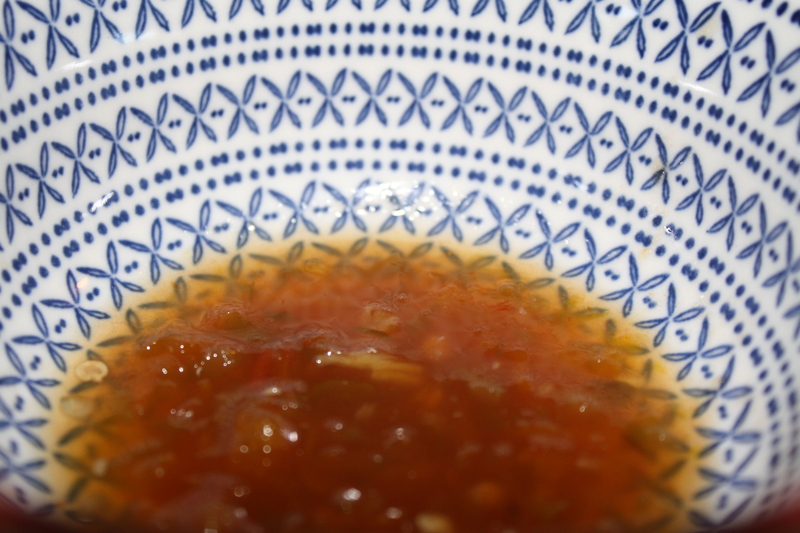 I also discovered (while I was impatiently waiting for the chicken to cook) that the sauce is great for dipping 🙂 We still have some left and I’m keen to try it on griddled salmon next! Kate sells at a range of markets in Devon and Cornwall but you can also find her at her website here. P.S. Apologies for the rubbish photos which really do not do it justice – I was too hungry and impatient to faff around with the camera!